Morgan’s writing style is crisp and straightforward but rarely elegant, descriptive or colorful. He is not a particularly engaging historian/storyteller and his coverage tends to underplay dramatic scenes or moments. And because his narrative focuses so squarely on Reagan, the “big picture” is often hard to find or appreciate. Despite its ostensibly comprehensive coverage of Reagan’s life, this 333-page book is unlikely to remind most readers of a traditional cradle-to-grave biography. It is too lengthy to serve as an excellent “efficient” comprehensive biography…but for the most part it lacks the depth and detail available in most full-scale biographies of Reagan. Reagan’s pre-presidency is covered quite swiftly. 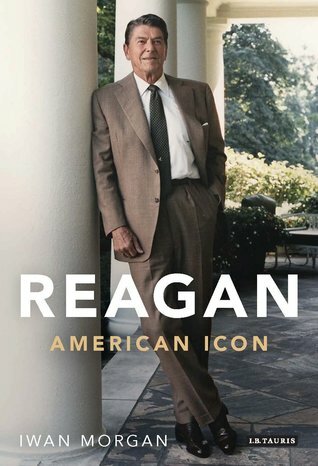 Readers already familiar with Reagan will find these chapters far too cursory while readers new to his life will miss out on countless revealing stories and colorful details from his first seven decades. His presidency receives more deliberate coverage, but the author still fails to expose many of the fascinating behind-the-scenes details of Reagan’s political campaigns and his presidential administration. It is not until the book’s final chapter that this biography’s considerable value is fully revealed. Here, in about twenty pages, Morgan reviews Reagan’s post-presidential life (and health issues) and assesses his political legacy – within the context of his own times as well as today’s political scene. This is not just the best feature of this book, but it also proves to be one of the most critically objective and thoughtful assessments of a presidential legacy I’ve ever read. Some of the value of Morgan’s appraisal may be due to the fact he is British and is more detached than most presidential biographers from the partisan American political scene. Morgan sees events from a third-party perspective and is able to remain remarkably objective throughout the book…giving Reagan credit for his many achievements while never failing to call him out for his failures and faults. The book has numerous individual moments of strength, of course, including a good explanation of the role of religion and faith in Reagan’s life, a useful summary of Nancy’s role in her husband’s political career, an interesting review of the turf wars which bedeviled the early Reagan administration and an almost uniquely meritorious examination of whether (and to what degree) Reagan deserves credit for ending the Cold War. But, in the end, it is the “outsider’s perspective” which lends the book the most value. Overall, Iwan Morgan’s “Reagan: American Icon” occupies an unusual space in the pantheon of Reagan biographies and is almost uniquely difficult to rate. As a comprehensive biography it is frequently mediocre. But as an exceptionally objective and thoughtful review of Reagan’s legacy (and modern American politics more generally) it is refreshingly superb. Glad Spitz made the cut… looking forward to that one. Only Reagan books I’ve read have been Heilbrun and Morris, and neither was fully satisfying. …I’m glad Spitz’s bio came out in time to make my list – it was close! And I certainly hope I’ve saved the best for last.